Happy Mondays with the Community Kitchen is always a celebration of the best local and seasonal ingredients: the room will be decorated and the welcome warm. But it will also offer opportunities for volunteers to build their kitchen confidence, learn about local suppliers and discover new recipes and ideas. Our aim is to highlight what’s growing in and around Bungay in gardens and on farms, show how local, seasonal eating is not only healthy, enjoyable, good for the local economy and environmentally sound but also exciting and surprising. If you’d like to get involved, perhaps supplying ingredients from your garden to the kitchen, cooking, suggesting recipes or helping meet and greet please do contact us. Happy New Year! We start 2016 with a trip to the Eastern Mediterranean. Those who watched Rick Stein’s “From Venice to Istanbul” (or have the cookery book) will know what a fabulous range of dishes are to be found there. 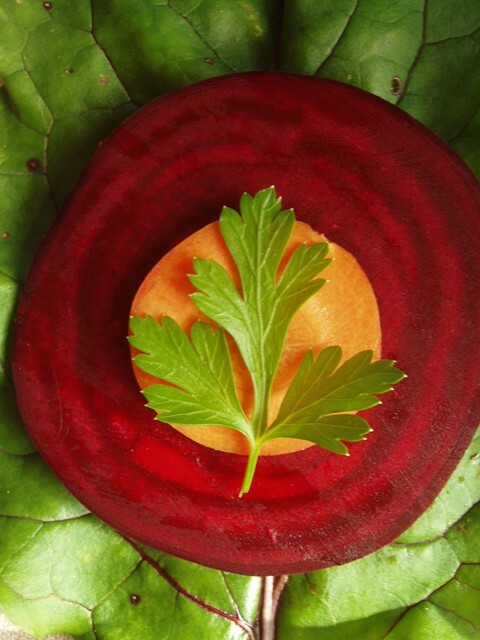 We will be serving dishes from Greece and Croatia with as much local produce as we can find at this time of year. Please come along and support us. The cooks, room setup and clearing up and cleaning folks are all volunteers who pay for their meals. If you could spend a few minutes helping to clear and/or wash up at the end, that would be much appreciated. Happy Mondays at the Community Kitchen have given into the demands of their diners and produced a seasonal cookbook with great emphasis on buying locally, cooking from scratch and celebrating the abundance of available vegetables. We were lucky to receive some funding from Lloyds Bank Community Fund which enabled us to produce The Happy Mondays Cookbook. It has taken a while to put together but we are delighted with the results. We are really pleased its out in time for Christmas and a number of people have already said they will be giving it as a Christmas present. The Community Kitchen will be celebrating its fifth anniversary next year. It is run by volunteers from Sustainable Bungay. The Happy Monday Meal is on the third Monday of each month at Bungay Community Centre. The cookbook is priced at £7.50 and is available to purchase from Bungay Library and Earsham Street Café in Bungay as well as online from the Hodemedod Website. Back in the 1990s, when I first began work in community outreach for a small retail co-operative in Nottingham, I quickly learnt the power of food to connect people. I saw how, despite apparently very different backgrounds, people could share a passion and a purpose – whether it was about growing food organically, the social justice issues around fair trade or simply local access to good quality affordable food. Most people feel powerless to effect the kind of big changes we desperately need to see. But I think that scale of change is within our grasp – it’s just a question of realising it and understanding the many (often very small) steps required to get there. In my experience food is often at the heart of those first steps, not only because it’s fundamental to all our lives but because shared meals, produce and growing spaces bring people together, reintroduce them to each other and, potentially, reconnect them with the way their food is produced and how it gets to their plate – even if it’s just a few radishes in a window box. 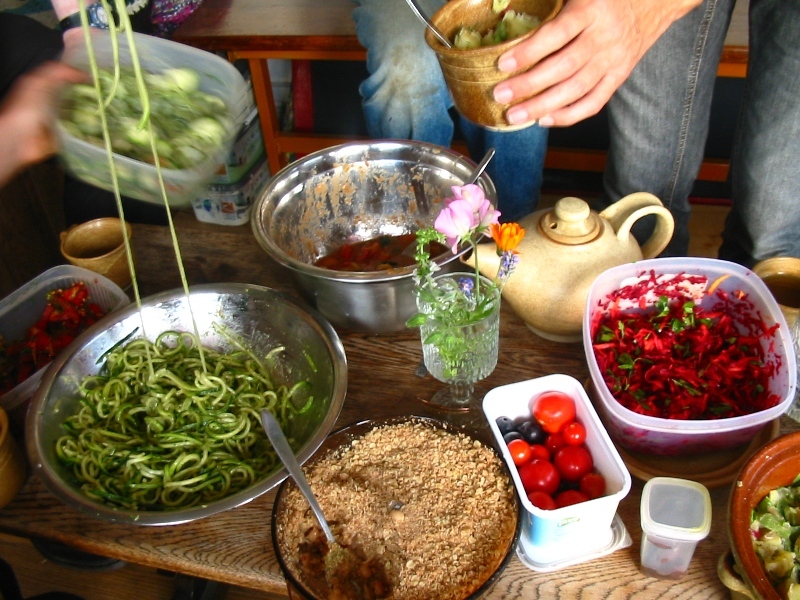 That feeling of doing something radical the first time you grow, harvest, cook and share something with your friends or family never really goes away. It’s the feeling that you have somehow evaded the corporate supply food chain; that you’re on the path to somewhere else. And from the point of taking control of the radishes in your salad, from securing a supply of food from local producers, you begin to take control of your dinner plate and the social, economic and environmental impact it has. Because taking our food into our own hands is a deeply political and potentially powerful act; it empowers us and makes a positive statement about how we want things to be. From this sense of agency we can exercise a lot more influence within our communities. In the context of many Transition groups, it gives people a set of very immediate practices and a rationale to underpin what they are doing. In my own initiative of Sustainable Bungay we realised if that if we wanted to see local growers and producers flourish then we needed to demonstrate that by providing a market for their goods: by eating what they were growing. As a first step we set up a monthly community meal, ‘Happy Mondays’, which would highlight seasonal produce that was being grown in and around the town. Happy Mondays serves up 50 meals once a month, we celebrate local producers – from gardeners and allotmenteers to smallholders and farmers. But we also cook together, decorate the room, give talks about food growing and keeping hens, develop ideas, build friendships and strengthen our group. What we have seen with Happy Mondays is that when people have gained some confidence about working together it also gives them the confidence to ask, ‘What other projects could we tackle?’. One occasional supplier to Happy Mondays is our own community garden. In 2010 the group ran a weekend introduction to permaculture and used as our case-study Bungay Library’s empty brick courtyard. 16 or 17 people came up with a design for a garden and then went about creating it. Now there are fruit trees and beds with flowers, vegetables and herbs, but it’s tiny – it’s not going to feed the town by any measure. Six months after we’d begun the process of creating the garden Suffolk County Council threatened to close our library if a volunteer group didn’t step up to run it for them. Suddenly there was a passionate group of people who’d organised and achieved something in that space. And they said: No, we’re not going to a) let the council close our library or b) let them assume that just because we’re interested in the library we want to run it. And we began a campaign that linked up with library groups all over the county and ultimately led to Suffolk County Council changing its policy. 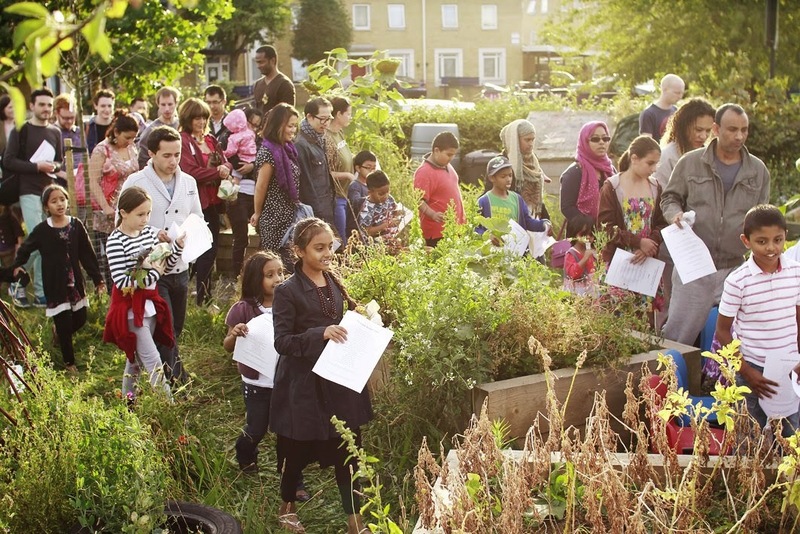 A garden is a physical presence in a community that’s visible to local politicians, community leaders, schoolchildren, everyone from faith groups to non-governmental organisations, many of whom may have no particular interest in food, but are interested in showing people different ways of doing things. It’s a public space where events and workshops can happen, where a child can have a life-changing experience. And there are intangible benefits that come to a place and people with that garden that can’t be measured or monetised, that play out with each growing season, not just over years, but over decades. 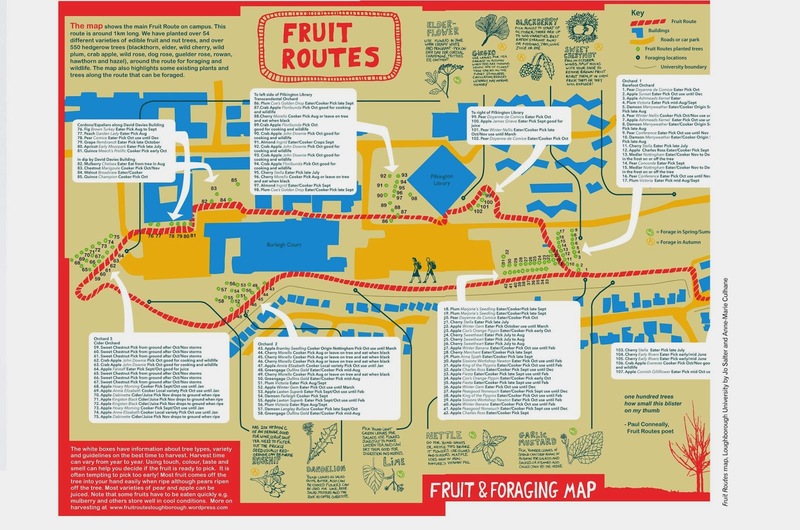 Images from Playing for Time: Fruit and veg collectors at Little Patch of Ground, London 2012; photo by Encounters Arts; Seed Library poster by Transition San Franscisco; Fruit Routes map by Anne-Marie Culhane and Jo Salter, Loughborough University: The Edible Garden, Tower Hamlets, London, produced by Phakama and Fabio Santos, photo by Caroline Gervay. Extract published from Playing for Time – Making Art as if the World Mattered (Oberon Books), £16.99. Copyright Lucy Neal. The making of Playing for Time will be discussed by the book’s editor Charlotte Du Cann at a talk on Monday 27th April, 2pm at Southwold Library. This week saw the departure of one of Sustainable Bungay’s key movers and shakers, Nick Watts. To celebrate his very active presence amongst the group and to wish him well the comms wing of SB wrote and produced a special newsletter as a farewell card. Here it is! Welcome to our souvenir issue of Sustainable Nick! A newsletter all about our fellow community activist, the grassroots economist, winemaker and grower and sharpest notetaker on the block, Nick Watts. After 20 years living in this fine old town, and six in the challenging new era of Transition culture, Nick is moving with his family to South Wales. In celebration here is our autumn edition that charts his unforgettable contribution to the group. Nick burst into Sustainable Bungay our annual Christmas party in 2008, and almost immediately took up his notepad and become the Secretary for all our core group meetings. His organising skills and dynamic energies have been key to all our activities from Give and Take Days to Green Drinks to running the Greenpeace Tea Tent in 2011. He also seeded and led several innovative new projects (see below) and inspired many folk to get involved. Communicating the hidden worlds of finance however was what perhaps fired him the most. ‘Skintnick’ felt people really needed to know the facts around the fragile and illusory nature of our monetary system. His talk, A Tale of Two Curves – On the conspiracy of silence on natural limits and economic growth in June 2010 was a witty, full-on whistle-stop tour of economic history, and explored ways in which we might become resilient within the Transition framework and the local economy. During 2011-12 when the Occupy movement had the world thinking about money in a new light, Nick was often to be found at the Occupy Norwich camp speaking about the radical changes needed in the global banking system. He also organised a thrilling nighttime march up to Norwich Castle to commemorate Robert Kett and the Norfolk uprising against the “hard-hearted elite” in 1549. In an interview with co-chair Mark Watson, Nick explained how being involved with the Transition movement changed his life. “You become friends with people you’re working with on a common understanding, for a common good. Transition casts a different light on everything you do. You’re thinking in a bigger way about the systems that underpin our lives, but acting from where you are. “You’re simplifying your life so you are less dependent on a high income, high energy use and the industrial food system. Peak Oil presents the very real possibility of these fossil-fuelled ways of life being taken away. I see it as a responsibility, especially if you have children, to take it seriously. “None of knows exactly what is on the cards for the future – but our bet (6-4 favourite) is that Sustainable Nick will make the valley he is headed for a greener, more switched on and joyful place. One thing is for sure: we will all miss him here in low-carbon Bungay. Thanks for everything Nick and happy moving! Images: On the move: Nick with the all-important chair, Give and Take Day, 2011; making medicinal raspberry wine, Plants for Life workshop, 2012. Food is never far from Sustainable Bungay’s collective heart and from the off our events have been accompanied by homemade cakes, seasonal soups and even our local take on tapas. But it was Nick who suggested we should turn eating into the main event. Like a lot of good ideas Happy Monday was dreamt up in the pub – it was to be a regular meal demonstrating much of what SB is all about; supporting the local economy, working co-operatively, and celebrating farmers and gardeners in and around Bungay. Unlike a lot of ideas discussed over a pint this one has grown into a very real and successful venture – thanks in no small part to Nick, who having come up with the idea, organised the first meal (a pie and mash night) in May 2011. 33 Happy Mondays later and almost 2000 meals have left the kitchen since that pub chat. Nick has been involved with every one of them; cooking, supplying home-grown vegetables, buying local produce and demonstrating his formidable washing-up skills. We are now left with a wonderful legacy for the Community Kitchen the future. Cheers Nick! In 2010 Nick took the lead in creating the Bungay Library Community Garden. In January Sustainble Bungay held a permaculture course taught by Graham Burnet off Spiral Seed. Their mission: transforming the bare brick courtyard into a flourishing showcase garden. Working to the collaborative design Nick co-ordinated a team of volunteers, who built raised beds and filled them with donated soil and compost, plants and trees, as well as installed rainwater butts and a composting bin. The Gardem opened the following year with a great celebration has since hosted dozens of events, including the bi-annual Give and Grow plant and produce swaps, also organised by Nick. It’s now a hub for many of SB’s activities and a peaceful and sustainble green space for all the community to enjoy. NR35 was another plant-based enterprise devised by SB’s green-fingered entrepreneur. Based on Bungay’s postcode the NR35 (‘Natural Resources’ 35) group explore “how to use our skills, knowledge and labour to generate an income by sustainably managing/harvesting the resources which are wildly abundant around our rural market town.” The results include the harvesting and distributing of fruit and vegetable gluts, some of which are supplied to local restaurants and grocers, play area regeneration, dead hedge making and building a communal firewood store. This Saturday (11th October) SB’s Mark Watson will run three raw food demonstrations at local Bungay greengrocers, Giddens and Thompson, as part of this year’s Waveney Valley Food & Drink Festival. And it won’t just be lettuce salad! Tickets cost £5 and booking is essential as places are filling up fast with a maximum of ten people at each demo. So if the idea of raw food piques your taste buds, call Simon on 01986 897944 and let him know which demonstration you’d like to attend: 10am, 12noon or 2pm. Each session will last about 30 minutes. Look forward to seeing you there! Note: All of the raw food dishes I’ll be preparing on Saturday have been previously tried, tested and thoroughly enjoyed at Sustainable Bungay’s monthly Happy Mondays at the Community Kitchen meals. This post was first published on 24th September 2014 under the title Mark Watson on Making Space for Flowers as part of the “Making Space for Nature” theme on the Transition Network website. It appears here unabridged. “Did you grow all those yourself?”, a young woman asked me last week at Transition Town Tooting’s 7th Foodival. She looked suprised, almost shocked. “My only reference for that kind of thing are the supermarket shelves,” she said. In that moment I realised many things all at once: that events like the Foodival show how we can come together and regain autonomy over what we eat (and drink); that you never know who will walk in the door and get switched on by something they’ve never considered before; that making space for nature goes beyond the world of nature reserves, wildlife documentaries or even pilgrimages into the wilderness. I also realised that an intrinsic engagement with the living world is what I’ve been showing and teaching in the last six years since I became part of the Transition movement; and that Transition has offered me a role where I can use my knowledge and skills to bring plants and people together in a dynamic and inspiring way. Bungay is a small rural market town of 5000 people on the river Waveney in north-east Suffolk, surrounded by conventionally farmed agricultural land. The common idea that people in rural areas are automatically more connected with nature can be misleading. Wherever we live now much of the time is spent in artificial spaces: in front of computers, television screens, in our minds and indoors. When I consider Sustainable Bungay, the Transition group where I’ve been most active since 2008, I see that (re)connection with living systems and considering the planet is implicit in everything we do, from the permaculture inspired Library Community garden, to the Give and Grow plant swap days to a cycle ride down to the pub by the locks of the Waveney at Autumn equinox. The very first Transition event I led was a Spring Tonic Walk introducing people from Bungay and Transition Norwich to dandelions, cleavers and nettles, the medicine plants growing in the neighbourhood. Our monthly community kitchen, Happy Mondays is now in its fourth year. 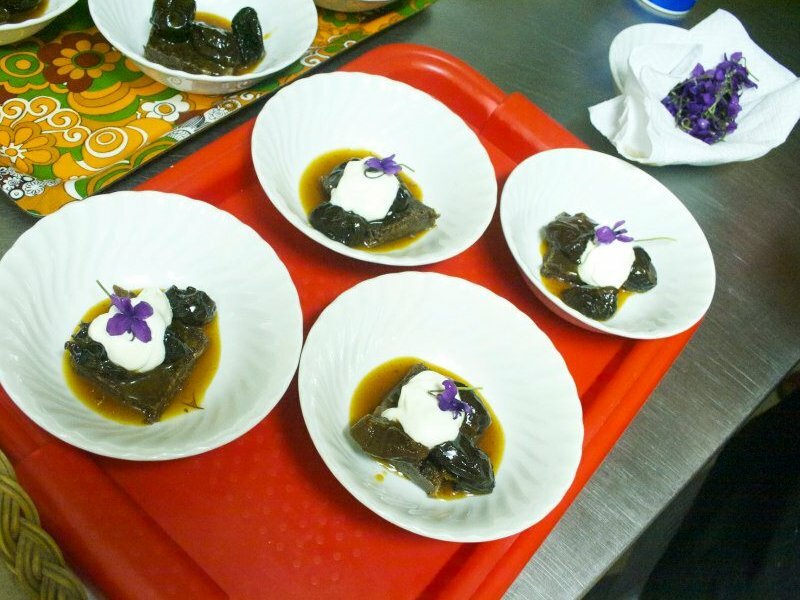 A meal for 50 people, most of it locally sourced, is prepared from scratch in under three hours and features everything from nettle pesto and bittercress salad to puddings with foraged sweet violets or blackberries from the common. Bungay Community Bees was formed in 2009 in response to the global pollinator crisis. There are now more than a dozen beehives in orchards and gardens in and around the town. The group has also created a purpose-built apiary (an observation shed with a hand-crafted glass hive) in association with Anglia Regional Co-operative Society and Featherdown Farms. 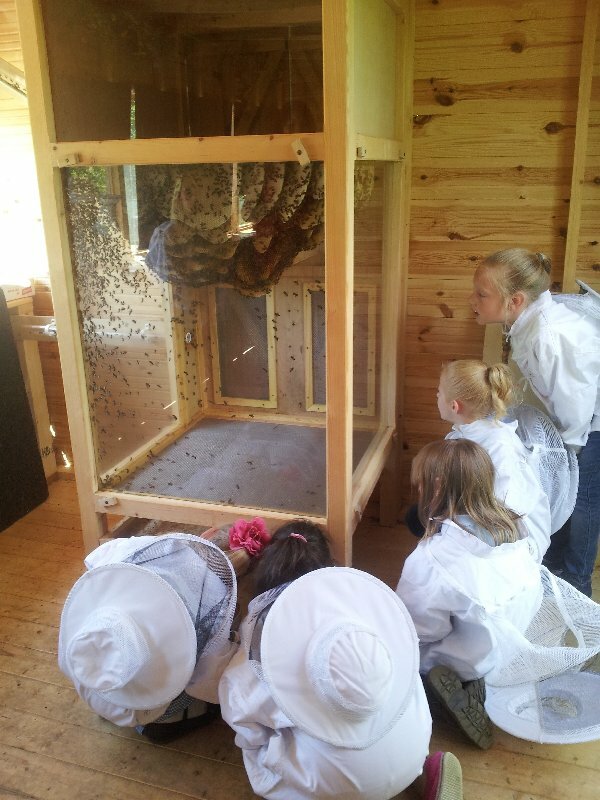 In the summer schoolchildren from the region come to visit the bees and go on nature walks where they learn about flowers and pollinators. Even behind the Give and Take days with their ethos of Reduce, Reuse, Recycle, Refashion, Re-just-about-everything, there is the sense that the planet needs a major break from all the stuff the industrial system keeps pumping out. Nature needs a breathing space! 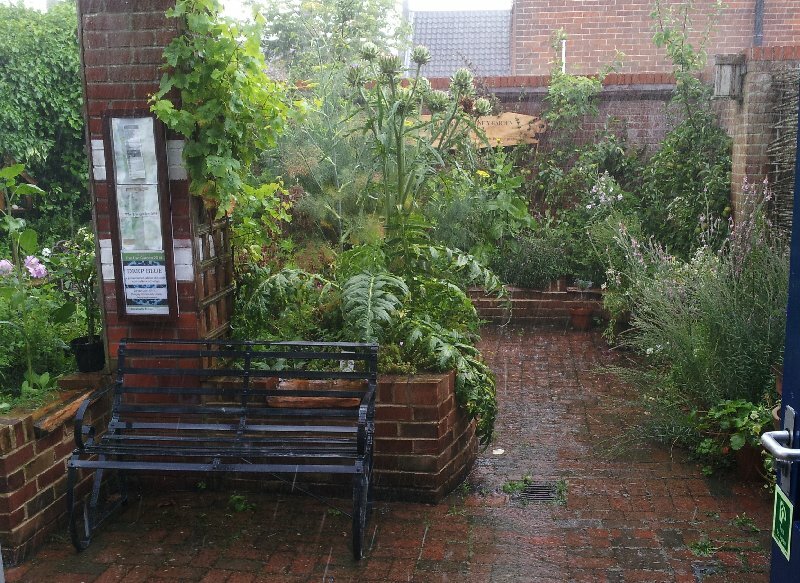 A natural breathing space is among the many things that Bungay Community Library Garden offers. In 2009 a subgroup from Sustainable Bungay teamed up with the town library, organised an Introduction to Permaculture course with Graham Burnett and worked with local builders, gardeners, tree surgeons and group members to transform the unused brick courtyard with one jasmine and a honeysuckle into a flourishing community garden with raised beds, fruit trees, flowers and herbs. Each year since its opening in 2010, the garden’s central bed showcases a different theme: plants for bees in 2011, plants as medicine in 2012, an edible bed in 2013 and this year dyes and textiles. This way people can get a feel for just how multi-faceted plants are and just how interwoven they are in our human lives. In many cases the categories change but the plants stay the same. The calendula you made a tea from in 2012, you tossed into a salad in 2013 and dyed a scarf with the following year! The person curating the garden each year organises events around the theme. 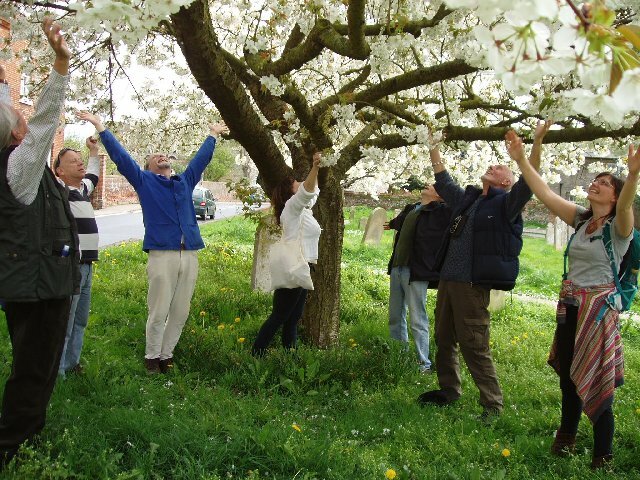 In the Plants for Life series I ran in 2012 focusing on health and wellbeing, there were monthly talks, walks and workshops with guest speakers, on everything from biodynamic growing to walking with weeds to the medicinal properties of homemade wine! I also ran ‘plant surgeries’ during the summer where people could come and ask questions about the project and the plants and exchange their knowledge too. The garden has become a focal point for many of Sustainable Bungay’s activities from steering group meetings in the summer to seed and produce swaps, Abundance exchanges of foraged fruit, and apple pressings. It is also the starting point for the wellbeing walks begun by the Arts, Culture and Wellbeing group last year. The idea behind the walks was to explore local places together to encourage wellbeing and a sense of belonging. How that might increase personal, and particularly community, resilience, help combat the desire to be somewhere else and so encourage lower use of fossil fuels. 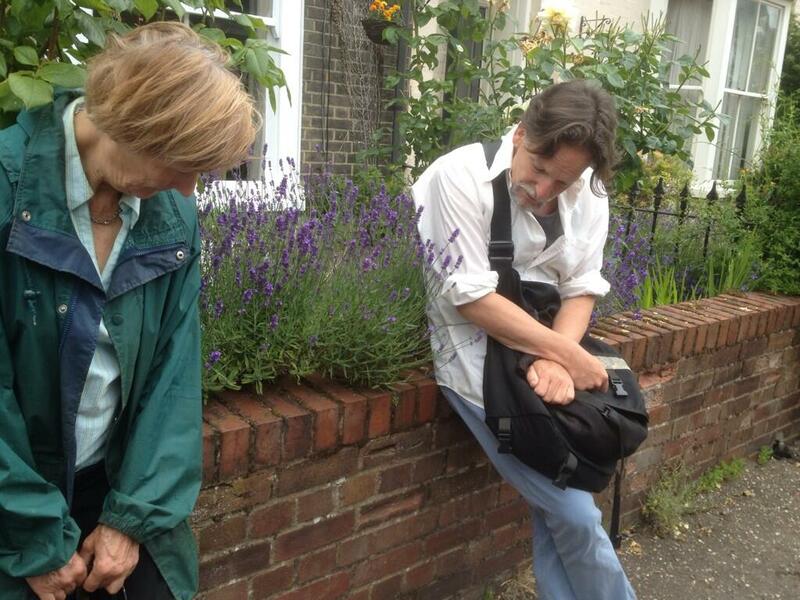 Many people reported that simply by taking part in the collective walks brought an experience of wellbeing in itself. There is more. Recently a group called NR35 (‘Natural Resources’ 35) based on the local postcode, began to explore “how to use our skills, knowledge and labour to generate an income by sustainably managing/harvesting the resources which are wildly abundant around our rural market town.” The results include the harvesting of fruit and vegetable gluts, some of which are supplied to local restaurants and grocers and a communal firewood store. Last spring a small group of us learned how to make a dead hedge with local tree surgeon Paul Jackson. It took just a morning but I remember practically everything Paul taught us. So what I’m saying here is that making space for nature can start right outside our doors, and in the places we find ourselves. That it’s not always the big exotic landscapes abroad where Nature is to be encountered. We need to discover the natural world where we are and engage with it, because it’s the natural world that makes sense of everything in the end. In 2015 it will be my turn again to curate the theme at Bungay Community Library garden, and the focus will be on ‘Helpful Herbs’ of all kinds. Lavender and rosemary are settling into bed, with thyme, St. Johns Wort, sweet cicely and others already there. And I’m working with a team on some exciting events. I’m also planning to map the project as part of a group helping to shape a new Transition Diploma, a collaboration between Gaia University and the Transition Network. Oh, and to make it into a Transition livelihood! Mark Watson is co-chair of Sustainable Bungay, a Transition Initiative in Suffolk, UK. Mark teaches groups and individuals to reconnect with nature through plants in the places they live. Details about his talks, walks and workshops can be found on Mark in Flowers. STIR magazine is a “reader-supported” printed publication which appears quarterly in the UK and beyond. STIR looks at “the inspiring and practical co-operative, commons-based and community-led alternatives to the crises in our food, finance systems and other important aspects of our lives.” In the July issue, Mark Watson wrote an article on Sustainable Bungay for STIR’s regular Transition column. The article includes a brief history with mentions of many of our projects. He republishes the column here in its entirety. The images did not appear in the printed article. The original title was Small is Beautiful in Sustainable Bungay. For subscriptions to STIR magazine see here. The Autumn 2013 issue is out at the beginning of October. November 2007 A young zoologist called Kate stands up after a climate change conference at the Emmanuel Church in the small market town of Bungay in the Waveney Valley, Suffolk, on the edge of the Norfolk Broads. Climate scientists from the University of East Anglia, a Met Office spokesman and local MPs have presented a sobering scenario of the effects of climate change over the coming century in our flat, agricultural waterland– from flooding and land salination to food insecurity and the possibility of malaria becoming endemic. Four people join Kate and Sustainable Bungay is born. 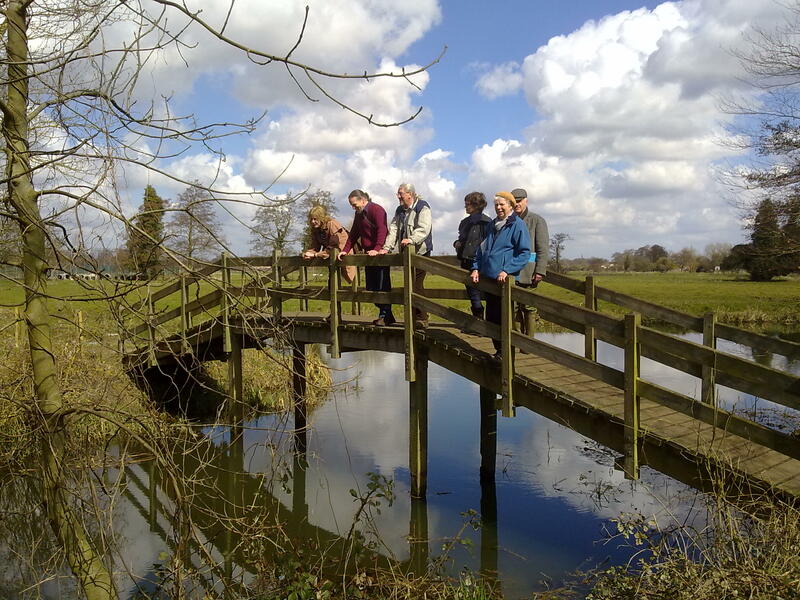 Sustainable Bungay has grown since then, although we remain a small, diverse group, making mostly small, local, community moves through a range of projects and events open to anyone. This is not to say that Sustainable Bungay has no influence, but we are a grassroots rather than a mainstream organisation, and often invisible. Behind everything we do, whether it’s a Give and Take Day, themed Green Drinks, or community bike ride, is an awareness of increasing climate and financial instability and the depletion of fossil fuel resources. How do we relocalise in terms of food, energy, the economy? In 2008 we became a Transition initiative, now a network of over a thousand groups in the UK and worldwide, aiming to decrease dependence on fossil fuels, relocalise economies and build resilience starting at a community level. At Happy Mondays at the Community Kitchen each month, 50 people sit down to eat a meal together at one table in the Community Centre. The meals are cooked from scratch in three hours using seasonal and mostly local ingredients, including foraged food and produce from peoples’ gardens and allotments. The table is always decorated with fresh flowers and each meal has a theme with a short talk on subjects ranging from backyard hens to Mexican conviviality to food security. The crew contains experienced cooks, growers and gardeners all pooling their knowledge and experience. We’re all getting used to working and eating together again, using less energy and fostering independence from the industrialised food system. Bungay Community Bees is a response to the worldwide decline in honeybees and the first ‘community-supported apiculture’ project in the country. The group has five hives in orchards and gardens around the town, beekeeping ‘in a bee-centred rather than beekeeper-centred way’. BCB has planted wildflower meadows, held two Bungay Beehive celebrations and has now teamed up with the Anglia Regional Co-operative Society and a nearby farm to arrange school visits to a purpose-built apiary. Every primary school in the area has signed up to visit the bees. We also work with other groups. In 2011, when the library was threatened with closure due to the government cuts, Sustainable Bungay got behind the Save Bungay Library campaign and helped organise poetry events, readings and awareness-raising days. Josiah gathered hundreds of email addresses from people supporting the campaign and we got communicating. The library was saved. This was great, not least for Sustainable Bungay. Not only are many of our meetings held at the library, we had also built a community garden in the courtyard in 2010, a place anyone can go to read, relax or learn about plants. The central bed has a different theme each year with talks and workshops. In 2011 this was bees, last year plant medicine. This year the bed is edible! Apart from the bee group, Sustainable Bungay has no external funding. All income is derived from Happy Mondays and donations at events. So after five years as an unincorporated voluntary organisation with a bank account, a constitution, a chairman, secretary and treasurer, we are now looking to become a Charitable Incorporated Organisation. 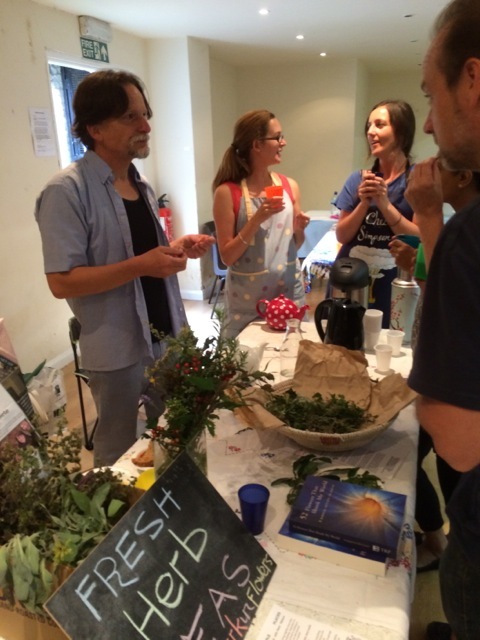 Why does a group of fifteen to twenty people invest such time and energy organising projects and events like Happy Mondays, plant swaps, Green Drinks and wellbeing walks, as well as maintaining a website and producing a quarterly newsletter and diary? Why does the core group have an open planning meeting every month anyone can attend? Why do we do these things? For over fifty years in the West most of us have had the means to live an individualisticall-about-me lifestyle due to abundant cheap oil and ready credit. If we didn’t feel like having much to do with other people, we could literally afford not to. This is changing. Sustainable Bungay and hundreds of other similar initiatives worldwide, through consistent actions within our communities, are relearning the art of working together with other people, sharing skills and helping to create a new culture, a culture that’s more about ‘us’. This ‘us’ includes people, bees, plants and the rest of the living world. We start local, paying attention in small ways to where we are, together. We do it for a different kind of future. May 2013 SB’s new subgroup and “social enterprise”, NR35, has just laid a dead hedge in Richard’s wildlife garden. Nobody had prior experience of dead-hedging except Paul, who is a tree surgeon. He taught us how to drive the stakes into the ground, build the hedge up with recently pruned and dead branches, and finally make it secure by jumping on it. These dead hedges become havens for wildlife including birds and insects who make their homes in them. It took five of us under two hours to complete. Richard was delighted, as was his next door neighbour. Wildlife-friendly, people-friendly, climate-friendly, the hedge seems the perfect embodiment of Sustainable Bungay. A small, beautiful, sometimes invisible thing that benefits life within and beyond its boundaries. In March, Happy Mondays, Sustainable Bungay’s monthly community meal, was visited by a journalist from Delicious magazine. She was researching a story about groups like ours who are growing, cooking and eating food together. For those of us usually absorbed in menu planning, dressing the room, cooking and washing-up, stepping back from the fray to answer questions about why these celebrations of local, seasonal food happen was a useful opportunity for reflection. Happy Mondays is inspired by the shared meals we struggle to find time for these days; based on seasonal food and simple recipes, with all ages involved in cooking and eating – sharing their skills and the effort. They’re the kinds of meals we might have seen and experienced in southern Europe or in the English rural tradition of harvest and celebration – sadly both are now less common than they once were. Our aim is to use local and seasonal produce from gardens, farms and allotments in and around Bungay and we hope to demonstrate that cooking with great ingredients needn’t be expensive or complicated – and that the results are delicious. We decorate the room with garden and wildflowers and seat all our guests, 50 or 60 every month, round a single table to encourage conversation and a sense of community. We aim to make the meals as accessible as possible, charging £5 for two courses to cover our costs. The money we take, around £6000 so far, is mostly spent locally on ingredients, kitchen hire and equipment. The meals offer a chance to find out what’s happening locally, either in general conversation or between courses when someone explains how we arrived at the menu; initially we’d feared these talks would seem intrusive, but we’ve discovered that people enjoy hearing about the food they’re eating – whether it’s back-garden hens, gardening in a changing climate or an update from our community beekeepers. As well as the social and economic benefits there’s an environmental rationale behind our meals; cooking and eating together uses less energy and creates less waste. And our meals are quietly vegetarian; this simplifies the kitchen work and helps us demonstrate how easy it is to eat less meat. Two years on from our first plans, hatched in the pub after a Sustainable Bungay core group meeting, and Happy Mondays has served almost 1000 plates of local food, has a team of 5 or 6 who plan the menus and source the produce and a pool of 20 or 30 who cook, wash-up, dress the room, greet and lay the table. We’re no longer fazed by the Community Centre’s idiosyncratic cooker and confidently turn out two courses for 50 people every month. Where once we had to advertise and struggled to fill every chair, now we’re always oversubscribed. As a collective we’ve started calling ourselves Bungay Community Kitchen and see opportunities beyond Happy Mondays – opportunities that could see us creating employment and offering training as well as spending money with local farmers, growers and independent retailers. It’s our BIGGEST ever Happy Monday! Happy Mondays with the Community Kitchen is more than a meal, it’s a monthly celebration of the best in local and seasonal food in great company. In July the Community Kitchen will be setting up its big table in the Festival Marquee and cooking a two-course feast for 100. The marquee will be decorated with garden flowers, the food will be cooked on site and there will be a bar selling local beer, cider and apple juice. Expect a warm welcome and delicious food! For this extra-special event there will be a licensed bar in the Marquee selling local beer, cider and apple juice. As ever the meal is £5 for 2 courses (including some of Mark Watson’s famous Herbal Refresher, but not including drinks from the bar). The meal will be served at 7pm as usual, but we’re asking people to arrive a little earlier – 6:30 – to allow us to greet everyone and help get people seated. We’ll be serving a herby summer vegetable barley risotto with Baron Bigod cheese; a radish, tomato and cucumber salad; a green leaf and edible flower salad and a courgette and carrot slaw with horseradish and yoghurt. The dessert will be marinated strawberries and cream. The bar will be serving Lightweight, brewed by the Waveney Brewing Company in Earsham and Aspall’s cider. THE COMMUNITY KITCHEN CREW WILL TAKE A WELL EARNED REST IN AUGUST, BUT WE HOPE YOU’LL BE ABLE TO JOIN US IN SEPTEMBER.